At first glance a drive up into the mountains that lie behind the Algarve coast exposes little but vast tracts of eucalyptus trees, but closer inspection reveals some of the finest places to see the wonderful wildlife of the Algarve. Eucalyptus is a non-native tree species. It has been planted because it is extrememly fast-growing and provides a quick cash return in the wood pulp market. A eucalyptus tree grows to a harvestable size in a third of the time it would take a pine tree to reach the same state, but the gains for the economy are outweighed by the devastating damage that this crop does to the landscape: the soil underneath these plantations quickly becomes degraded; the dense tree canopy crowds-out the native flora and fauna; and, in an area prone to forest fire, the oily eucalypts literally add fuel to the fires. On closer inspection, however, there are some wonderfully productive (in flora and fauna terms) pockets of mixed Cork Oak and pine woodland in the Monchique area. One of these lies immediately behind the village of Meia Viana, which is about two kilometres south of Monchique on the drive up from the coast at Portimao. 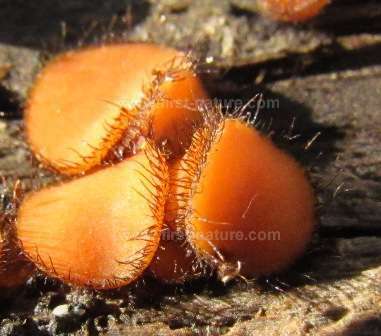 Below: The miniscule Eyelash Fungus (Scutellinia scutellata) on rotting timber in the woods at Meia Viana. Although Cork Oak (Quercus suber) is also grown as a cash crop, it is a native tree of the region and lives in greater harmony with the indigenous flowers, animals, birds and insects that make their homes in the woodlands and forests of the Algarve. When interspersed with pine, oak woodlands can become a paradise for the naturalist, who can enjoy seeing numerous bird species, wonderful spring wildflowers and wild orchids and, from October through to the end of March, countless kinds of fungi. If approaching from the A22 toll road you should take the exit at junction 5, turn onto the N266 towards Monchique and then follow directions below. From the main N125 take the turning onto the N266 towards Monchique. Keep driving up into the mountains towards Monchique until you come to the small village of Meia Viana. This is about a 30 minute drive. As you leave Meia Viana, look out for an acute right-hand turn off the road and take it. You will see a house called Casa Peralta on the right. Continue past the house, around a sharp left-hand bend, and about 100 metres further on you will come to a wooded area on your left, which is where the walk begins. There are a few places to park on the side of the road, and a small parking area just off the road on the right. There are cafes and shops in Monchique. 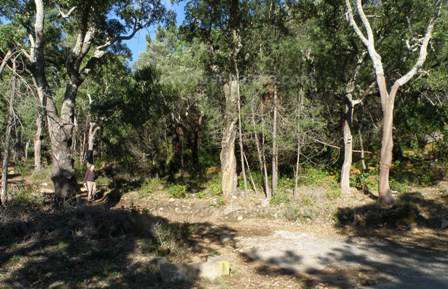 There is no formal path through the woodland, and some parts of the forestry tracks are steep and rugged, but throughout the woodland and in the surrounding area there is plenty of more level ground that is not difficult to access. April and early May is one of our favourite times to visit the woodlands around Meia Viana. Not only are there many lovely wildflowers to enjoy, but the woods are alive with birdsong and the almost continuous calling of the Common Cuckoo (Cuculus canorus). In Portugal, Common Cuckoos target the nests of other summer-visiting birds as potential sites to raise their young, laying their eggs in the unwitting hosts' nests. They then leave them to sit on the eggs and feed the fledglings, who soon eject the competing hosts' babies. Common Cuckoos are generally very hard to see, keeping themselves well concealed high up in tree canopies, and their rather dull, falcon-like plummage doesn't help with spotting them. There is a better chance of seeing the Great Spotted Cuckoo (Clamator glandarius), which is a much more handsome and brightly coloured bird and a well-known summer visitor to the Iberian Peninsula. It is about the same size as a Magpie and its wings are boldly spotted with white - hence its name. Its call is also very different from that of the Common Cuckoo and consists of rapid cackling notes and other chattering sounds, some of which are very close to the cawing of crows. 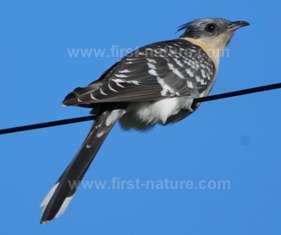 The Great Spotted Cuckoo parasitises Magpie nests where it lays a number of eggs (unlike the Common Cuckoo which lays only one egg per nest), and the hatched fledglings do not evict their hosts' young from the nest but compete with them for the food brought back by the parent birds. Look out for the Great Spotted Cuckoo in open woodlands and other scrubby ground with scattered trees. The journey up to Monchique is an excellent one for seeing White Storks, and in springtime you will easily spot the young birds sitting patiently in the nests while their parents go off in search of food. There are several Storks' nests visible from the road, and some of them are even in trees! Mainly they seem to build their nests on convenient pylons or other man-made structures such as chimneys, church towers and telephone poles. Once you get inland away from the coast many more of the birds of the Algarve will become apparent from their songs, even if they are not easily spotted: Black-eared Wheatears, Southern Grey Shrikes, Woodchat Shrikes, Corn Buntings, Thekla Larks and many others are out and about in the river valleys and woodlands. Up in the wooded hills the flowers are different from those opportunistic species that jump up in springtime on every piece of land near to the coast. In early spring the woodland is full of bright blue Single-leaved Squill (Scilla monophyllos), which is then followed by another interesting member of the Lily family (Liliaceae) that grows up in the mountains and wooded areas around Monchique - the curious Brown Bluebell (Dipcadi serotinum). It has few leaves which are concentrated at the bottom of the stem, and this combined with the dull brown flowers makes it very easy to miss. The flower spike grows to about 15cm tall and the flowers open on one side only, causing the stem to arch gracefully. In other respects these wooded mountain areas are somewhat reminiscent of the English spring, with plenty of Foxgloves and Campion (often White Campion, Silene latifolia, rather than the more familiar pink Silene dioica) on the roadside verges. In the damp ditches you may well find one of the two common birthworts that occur in the Algarve - Aristolochia paucinervis. This sprawling plant has green flowers that are hard to spot and are far less conspicuous than those of its close relative, Dutchman's Pipe (Aristolochia baetica), which has rich reddish-brown flowers and scrambles over dry stone walls and shrubs closer to the coast. These woodlands near Monchique are great places if you want to see some of the more unusual orchids that grow in the Algarve. Broad-leaved Helleborine (Epipactis Helleborine) is very common there, but if you are lucky you may find one of the hypochromatic plants with their green-white flowers devoid of any hint of pink. Another excellent find is the Violet Limadore (Limodorum abortivum): from April onwards its deep, vibrant flower spikes shoot up from the ground, looking for all the world like purple asparagus spears. Some years the flowers do not open, but in other years large clumps of these magnificent orchids bloom, revealing their gorgeous flowers. The woodlands are also home to the Heart-flowered Tongue Orchid (Serapias cordigera). Tongue orchids are fairly widespread throughout the Algarve, particularly the Small-flowered Tongue Orchid (Serapias parviflora) but to find the Heart-flowered ones always feels special. They have deep, blood-red flowers with a broad lip, which gives them their common name, and most years they come into bloom during April. 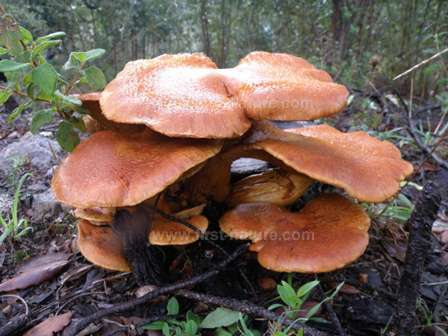 Once the Autumn rains arrive in the Algarve, mushrooms and many other kinds of fungi shoot up everywhere - on well-tended lawns, on roadside verges and most particularly in the woodlands. Fungi are easily as prolific as the wildflowers of springtime, and indeed the fungi continue throughout winter and well into spring, which makes springtime as good a time of year to be looking for mushrooms as it is for admiring the flowers. The woodlands at Meia Viana are no exception when it comes to 'fungirama' time and are actually an outstandingly good place to look for fungi from September right through until the end of March. Do not feel compelled to plunge straight into the woods, though, because many mushroom fruiting bodies are stimulated into growth by the continual compacting of the tracks by forestry machines, and lots of fascinating species pop up along the track edges. With the exception of a few Parasol Mushrooms (Macrolepiota procera) and the truly noble and delicious Ceasar's Mushroom (Amanita ceasarea) there are not too many good edible species in the woods, but there are many interesting and several rare species to delight the amateur or professional mycologist (if not the Head Chef!). The site is particularly good for those torture-to-identify Brittlegill (Russula) species; leaving frustration aside, they are glorious to see and range in colour from bright yellow, through white, black, brown, pink, orange and scarlet and into deep purple. Equally beautiful are the many coral fungi that hide beneath the leaf litter along with various club fungi. Other notable fungi to look out for in the woodlands include False Deathcap (Amanita citrina), Panther Cap (Amanita pantherina), Sheep Polypore (Albatrellus ovinus), Magpie Inkcap (Coprinopsis picacea), Scarletina Bolete (Neoboletus luridiformis), Girdled Webcap (Cortinarius trivialis), Orange Peel Fungus (Aleuria aurantia) and Wood Mushroom (Agaricus silvicola). As you leave the woodland be sure to look on the grassy verges of the road, as this is a particularly good site for Red Cage Fungus (Clathrus ruber).